Please help us welcome Chris J. Foley, who joined the Office of Online Education as assistant vice president and director on March 2 of this year. Chris has nearly 18 years of international and undergraduate admissions experience at IU Bloomington and IUPUI. This experience perfectly positions Chris to collaborate with staff and academic administrators on all campuses to recruit, support, and retain thousands of online students. Chris is already hard at work to promote the university’s new Bachelor of Applied Science, add functionality to the IU Online website, evaluate contact center activities, collect robust data about online students, assess and develop staff capacity, and broaden the IU community’s awareness about online education’s tremendous potential. We’re excited to have Chris with us. Under his leadership, we expect to see a rapid, profound, and sustainable transformation of online education at IU campuses across the state. The Office of the Executive Vice President for University Academic Affairs recently revised its website with the goals of making the office’s operations more transparent and of providing the IU community guidance and information regarding academic matters. The process for seeking approval of new online academic programs is also described on the site. We encourage those who plan to seek approval for online degrees to notify the Office of the Executive Vice President for University Academic Affairs early in the process. Send an email to Natalie Harvey, administrative assistant in the Office of Statewide Academic Relations, at nasharve@iu.edu. 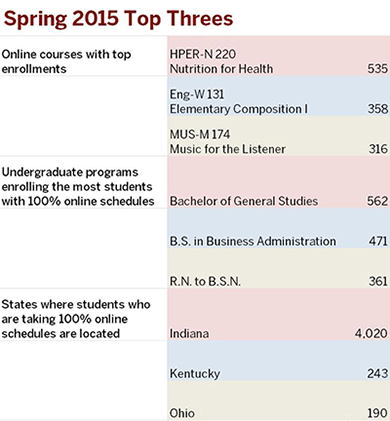 A multichannel marketing campaign for IU’s new Bachelor of Applied Science (B.A.S.) will be launched in May, giving potential students time to learn about the degree before fall 2015 admission application deadlines. Initial marketing efforts will target Ivy Tech alumni who hold an Associate of Applied Science (A.A.S. ), as well as current Ivy Tech students who have earned more than 45 credits toward an A.A.S. These efforts will include a custom web landing page, a brochure, a variety of digital ads, an email campaign, a post card, and on-site promotions at all Ivy Tech campuses. Subsequent marketing efforts will target adults in the five-state area who hold an A.A.S., already work, and want to advance in their careers. The B.A.S. is an online degree completion program open to anyone who already holds an A.A.S. It is offered jointly by IU’s five regional campuses. In web usability tests last year, students persuasively argued that the IU Online website should be devoted only to students. As a result of these findings, administrative information about the Office of Online Education has been moved from the IU Online website to the website for the Office of the Executive Vice President for University Academic Affairs. A new "teaching online" website will provide information for and about faculty who are teaching - or interested in teaching - online. It will include case scenarios, best practices, profiles of faculty who are already “doing” online education, and more. The new site is scheduled to launch at the end of July. In the coming six to 12 months, the IU Online website will be redesigned to provide students with even greater services while engaging them with interactive content. Launch of the new site will be in 2016.